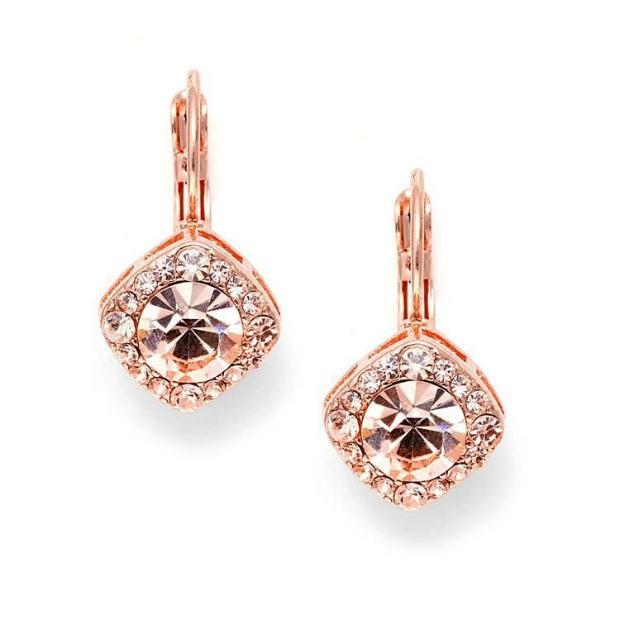 * Mariell's best selling earrings are 1" h and are plated in gorgeous Rose Gold with matching crystals in stunning peach-champagne. * These tailored wedding or prom earrings are available in an array of colors at a great low price! * For a sparkling design with tailored style, Mariell presents our top-selling Rose Gold earrings with a beautiful peach coral crystal solitaire framed with pave crystals plated in a rich Rose Gold setting. * These sophisticated bridal, bridesmaids or prom earrings are available in an array of colors at a fantastic wholesale price and are a must-have for every retailer!